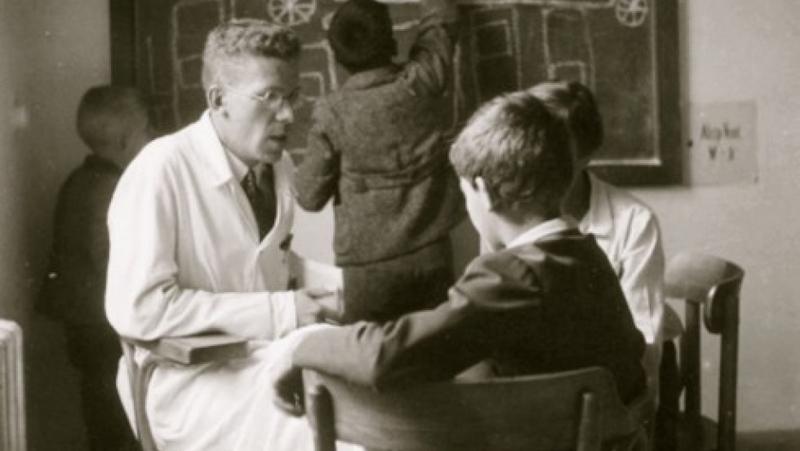 Hans Asperger and children at the University of Vienna, 1930s. 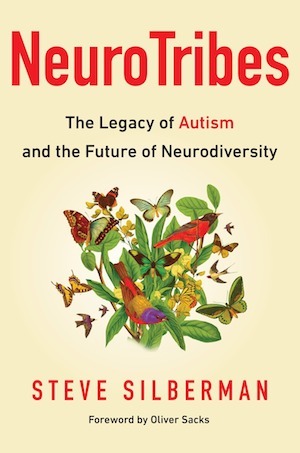 In NeuroTribes: The Legacy of Autism and the Future of Neurodiversity, Silberman takes us back to Vienna before World War II, where he introduces us to a young doctor named Hans Asperger. In the 1930s, Asperger was already studying what he believed to be a widespread condition among the children of his day — a mostly heritable condition composed of a whole spectrum of symptoms. More importantly, Asperger’s ideas about autism were decades ahead of their time, Silberman says. Asperger and his colleagues conceived of autism as a lifelong condition, lasting from birth to death, requiring special forms of support from family, teachers and the community. What Asperger described "was mapped pretty closely to what we now call the &apos;autism spectrum,&apos;" Silberman says. Some children, he observed, were unable to speak and might require individual support for the rest of their lives, while others would thrive in advanced classes in math and science. The rise of Nazi Germany disrupted Asperger’s work and changed the course of autism diagnosis and treatment for much of the rest of the 20th century. By the late 1930s, when the Nazis annexed Austria to Germany, they had also started passing eugenic laws, which compelled doctors, nurses and clinicians to report disabled children to Berlin. In addition, Jewish clinicians were forced to flee the country. One of them was George Frankl, Asperger&apos;s chief diagnostician. Frankl was rescued from the Holocaust by an American child psychiatrist named Leo Kanner. Frankl started working for Kanner in 1938. Donald Triplett also arrived in Leo Kanner&apos;s world in 1938. Triplett is considered Leo Kanner&apos;s first autistic patient. But initially, Kanner didn&apos;t know what to do with him. “He had seen some of these symptoms before in children — that he called pre-psychotic — but he basically wasn&apos;t able to make a diagnosis. So, he sent Donald Triplett to George Frankl for evaluation,” Silberman says. Having just spent 11 years working in Asperger&apos;s clinic, seeing scores of autistic children at all levels of ability, Frankl understood Triplett. In fact, Frankl evaluated Kanner&apos;s first three autistic patients. Then, in 1943, a year before Asperger published the results of his own work, Kanner wrote the paper that made him the world&apos;s leading authority on autism. What’s more, Kanner eventually blamed parents for triggering autism in their children. “The image of the ‘refrigerator mother’ came from Kanner&apos;s work,” Silberman says. “Bruno Bettelheim sort of made a career out of it later, but it was really Kanner who thought up that horrible idea.” ‘Refrigerator mother’ refers to the mothering of autistic children by cold, emotionally distant mothers, resulting in a dysfunctional mother-child relationship. Because Kanner and his colleagues viewed the disorder largely in emotional and psychological terms, the recommended course of treatment for autism became institutionalization. By contrast, Asperger believed the disorder was genetic and therefore had to be adapted to, not cured. Silberman believes the world can and should adapt to meet the needs of autistic people, in the way we have done for people with physical disabilities. This article is based on an interview that aired on PRI&apos;s Science Friday with Ira Flatow.